Hello. If you’re reading this, then this is probably you! When I started to write, I used to scour the internet, and author websites, for hints and tips on how to write a novel. It’s something I’ve done for years and I’ve pulled together a few of my favourite learnings and thoughts here in this A-Z. The advice and tips here aren’t set in stone, aren’t in a set order, and you may have your own way of doing things, however if you’re thinking of giving writing a novel a go, I hope you find these notes useful. What book or story should you write? My advice would be to write the book you wantto write, from your heart. Don’t be led by what’s selling at the moment as books can take a long time to come to market. If you see ‘X’ on a bookshelf in a shop, by the time you’ve written and tried to sell ‘the next X’ then the market may have moved onto ‘Y’. Think about what booksyoulike to read. Write your own ‘magna carta’ – a list of all the things you like to find in a novel. My own includes – quirky characters, twists, fun animals, small towns, modern-day settings, North of England, characters who undergo a transformation, etc. Stick your own list to your wall and use it as a blueprint for your book. Which comes first, character or plot? It’s a similar question to ‘what comes first the chicken or the egg?’ Some writers think of a plot then find a character to inhabit it, for others it’s all about the character and finding a plot for them to follow. I’m a plotter. I like to collect ideas from magazines, blurbs I’ve read on the back of books, reviews in newspapers, films and stories I’ve heard in the news. Then I pull a few strands together, change a few things, and weave something new. Speaking to a friend, he used to work in a factory with lots of great ‘characters’ so he tends to think of people first. There’s no right or wrong way, but every great plot needs great characters, and vice versa…whichever way you plan your book. Don’t worry too much about your first draft. Get your story down, any way you can. Scribble it in a note book, on sticky notes, talk into your mobile phone, find a quiet spot on your lunch break to type up a few notes. You can edit and polish it all up afterwards. I like to write a brief plot outline on sticky notes or postcards, a few lines per chapter, so I can use the cards/notes to move the story around and make sure it all runs through and works properly. If you wrote an important report at work, then you’d like an extra pair of eyes to look at it – right? To ensure it’s at its best? It’s the same with edits. If you’ve submitted your book to an agent or publisher and they suggest edits, then it’s good to take notice. They’re the industry experts after all. I actually love to hear different thoughts on my work, to see it from a fresh perspective, then to make the story and writing stronger. Make your first line, your first paragraph and your first chapter really count. Give it some punch. Pick up a few novels you love and see how other authors do it. Does the first line hook you in? Why and how? Don’t waste your first words by talking about the weather, unless it’s crucial and sets the scene for your book. The first sentence and paragraph should plunge your reader straight into the story. Ask yourself, what does your character want more than anything in the world? Once you know, you can take him, or her, on a journey to find it. If James Bond wasn’t actually that bothered about saving the world, or if Harry Potter wasn’t that interested in becoming a wizard, then their stories would be a lot less interesting! The reader has to invest their time in joining your character on their journey, so give them an exciting goal to aim for and a great story will follow. Whose story do you want to tell most? What will make readers want to know more about this person? Have they got any strange habits or obsessions? What are their strengths and weaknesses? Drill down the finer details to make them feel like real people. Think of your own favourite literary heroines and heroes. Write down what you like or admire them and what their best and worst qualities are. Now think of your own hero or heroine and do the same exercise for them too. Want to write a book but not sure of your idea? Why not think of your favourite 5 books or films, your favourite 5 people or celebs, your favourite 5 objects and favourite 5 places. Write them on postcards and select a card from each pile (1 book, 1 person, 1 place, 1 object) at random to see if this sparks any ideas. Writing a book can take a long time, so you may as well find influence in things, people and places you like! If your story is character-driven then your hero or heroine needs to change on their journey through the book. This may be physical, emotional or both. Your character should start off the story by thinking/acting/doing something in one way but by the end of book there will be a reversal. As you take them on their journey be sure to throw lots of intrigue and obstacles in the way, to make their journey as interesting as possible. K is for Keep going! Are you stuck for what to write? Do you find yourself staring at a blank computer screen? Then do some editing of what you’ve written already. Fed up of editing? Then write something fresh instead. Switch off the computer and make a few notes, longhand, on a scene that you really want to write. If you’re stuck on where to take a character next, and it just isn’t happening, how about trying a change of their name or thinking of an unusual object for them to discover. It might spark some new ideas. Agents receive hundreds of letters or emails from aspiring authors each week. Yours needs to stand out from the crowd. Check that you’ve spelled the agent’s name correctly and that you’ve used the correct address. Check on the agency website what their submission process is. It’s always good to personalise your query letter too, so it doesn’t look like you’re sending the same thing to every agent going! Do your homework and tell the agent why you’ve chosen to send your work to them, show that you know which other writers they represent. If you send a sci-fi novel to someone who is only accepting thrillers, you may be wasting your time and theirs. Popular novels are usually 90,000 – 120,000 words in length. You can have as many chapters as you like, whatever length you like. I like to keep my chapters relatively short, to hold the reader’s interest, as well as my own! However, they do need to be long enough to introduce your characters and story properly. I aim for approximately thirty chapters in total. Manuscripts should be neat and tidy – and don’t forget to spell check. Most agents specify on their website what format sample chapters/manuscripts should be submitted in, so be sure to check before you send. Your character’s name should say something about the person. 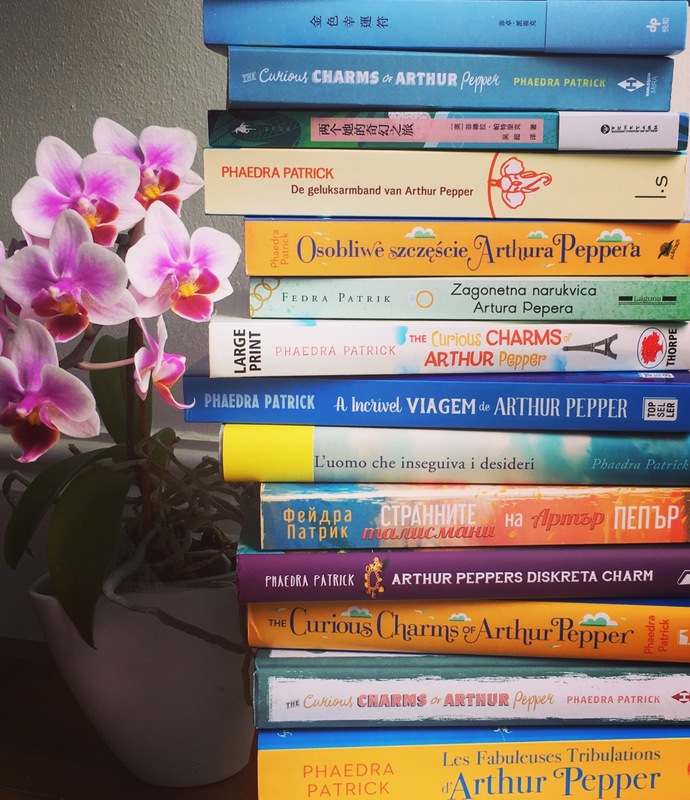 For The Curious Charms of Arthur Pepper I chose a traditional first name for 69-year-old Arthur and a more unusual surname to echo the quirky journey he makes. Take your character’s age and occupation into consideration too. You probably wouldn’t name a glamorous florist ‘Edna Smith,’ or name a daring action hero ‘Herbert Longbottom.’ Would James Bond conjure up the same, cool spy image if he’d been called Jimmy Bardsley? One of my characters was originally called Mildred and she didn’t come alive until I re-named her Miriam. Summarise your book in one or two sentences, so you have a ‘pitch’ ready. It’s not easy to do. I took a full weekend to work on mine for The Curious Charms of Arthur Pepper. Afterwards though, if anyone asked what my book was about, I could tell them confidently and clearly – ‘It’s about an old man who finds a charm bracelet in his late wife’s wardrobe. He sets off on a journey to discover, charm-by-charm, her secret life before they met.’ Rehearse it over and over so you can reel it off if anyone asks. If you search online, there are hundreds of publishers out there. Which is the right one for your book? And you’ve heard of the slush pile, right? Where manuscripts pile up on publisher’s desks until they reach the ceiling and where your work will never see the light of day? Literary agents know what publishers are looking for and can team your book up with the right one. When I first met my agent, Clare, she said that she would be my matchmaker, to find the right home for my book. And she did. If you’re serious about finding a publisher for your book, then my recommendation would be to find a great agent first. There are plenty listed on the internet. Make sure your work is as good as it can be. Maybe even ask a friend to read it over. Check and double check your spelling and grammar. If you’re not confident enough to tackle a full novel then you could give writing a short story a try. There are lots of them around on the internet. If you have any success they can give you a great confidence boost, in knowing that the quality of your work is good. Think of a setting for your book. So (let’s say) it’s about an old house where, after a death, a family gathers and they unearth a secret. Sound familiar? It’s quite a common plot. Now, what if the house was set on a wild Scottish coastline and was the only house around for miles? Or what if it was a mansion in Saint Tropez? The plot might be the same, but the setting conjures us very different sights, sounds and smells. Now, how would it work if, say, instead of a house, the book was set in a jazz club? Can you already smell the sticky carpets and stale cigarette smoke, and hear the sound of the saxophones? Play around with different settings and see which works best to bring your story to life. Yes, we’d all like more of it, please. However, is a fairy going to fly down with a magic wand and grant you more of it? You wish, huh? For my first few years of writing, I only did it after I’d loaded the dishwasher, phoned a friend, cleaned the windows, done the supermarket shop, etc. In other words, I only did it when I’d done everything else first – and by then I was often too tired. So, if writing is something you really want to do, then you need to find the time to do it. Tell your family that it’s beans on toast only on Mondays from now on or that you’re going to write for half an hour before bedtime. Pledge not to take business calls on your commute, because you’re writing instead. Be firm. It’s the only way you’re going to find that time for yourself to write. Writing can be a solitary pastime, but it’s a united effort to bring a novel to fruition. After the many months of writing The Curious Charms of Arthur Pepper I allowed a handful of close friends to read it. I’m glad I did as their support and comments spurred me on. Comments, thoughts and suggestions from agent Clare and editors Sally and Erika have made writing feel like a real co-operative effort. It’s easy to shut yourself away and to keep your writing a secret, but there is lots of support out there – friends, family, writing groups etc. It can be good to share. What makes your character unique and gives them their ‘voice’? I like to ask my character what they’d say if they banged their elbow. It can give a little insight into their personality. There’s a big difference between ‘Dang it,’ ‘Sh**!’ and ‘Jeez.’ Pretend that your character is sitting in front of you and that you’re interviewing them. (Yes, I know it sounds a bit strange, but it can help to chat to them). Ask them to tell you a bit about themselves. What are their problems and what do they want to say? What story do they want you to tell on their behalf? What are the ten worst things that could possibly happen to your character? Write a list, then make some of them happen. (Go on, be a bit cruel) How would your character react? What would they say? What would their emotional response be? What would happen if an agoraphobic found themselves locked in a lift, or a shy person found themselves on stage in a nightclub? Have a go and see what happens. No, not Simon Cowell. Your book and character have to have the x-factor to stand out – a quality to make them special. One tip is to make your character the ‘most’ at something he or she does. They might be the tidiest person in the office, or the untidiest. They could be the fastest swimmer in school, the richest person in the world, the greatest dentist in Manchester, the loneliest dog in the kennel, the most celebrated seamstress in Paris or the most hated TV critic in the US. Whatever it is they do, make them the ‘most’ at it and give them the x-factor. You don’t need youth to be a writer. Hurray! It’s one profession where you don’t need to be fresh out of university with a degree. In fact, the more experience you have in life, the more jobs you’ve done, the more people you’ve met, the more places you’ve visited, can all help in your writing. So dig deep into your life experiences and don’t let thoughts of ‘being too old to start writing’ pop into your head. If you’ve read all these tips and you still want to be a writer, that’s fantastic! Why not sleep on it tonight? Great ideas can often pop up when you’re at your most relaxed. Fluff up your pillow, pull up the duvet and let your mind take you to a place, and to people, you’d love to spend more time with. Then start to write about them! If you like these tips, why not follow Phaedra on Instagram, Twitter and Facebook? Or read her books, The Curious Charms of Arthur Pepper, Rise & Shine, Benedict Stone, andThe Library of Lost and Found to see how she did it!